With a Russian/Dutch heart: Snow almost all disappeared again. Snow almost all disappeared again. We took it very easy this weekend, mostly watching tv(speedskating, for one) and catching up some sleep. the two days of Christmas were kind of exhausting in the way, we went to bed rather late, because there were some nice detectives to watch, but they only started just after midnoght! What a time to broadcast it! Of course we could have taped them on dvd, but it was so nice and cosy and why not watch them right away? Saturday I went out for a moment, it then was snowing.rianing a bit, and the streets were covered with that aweful mix of melting snow. But it wasn;t still too bad, and the temperature was quite good. Yesterday it was still there, but this morning almost all was gone already, only in the garden some of it is still there, but will be gone soon enough. with temperatures a few degrees higher. I am glad it is almost gone again, for me this was winter enough LOL. Above is the appelflap", obvious made with apple and cinnaomon. 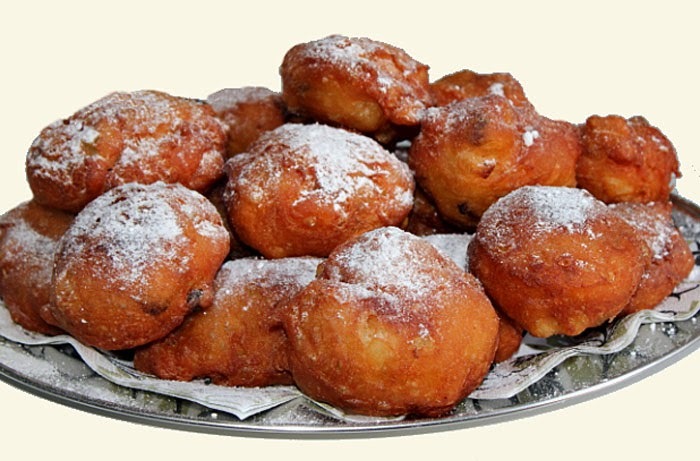 And here the "oliebol"filled with raisins, but you can also put in whatever you want, small dices of apple, or banana, or dried fruit. But I like them best the "old"way, only lots of raisins in them. 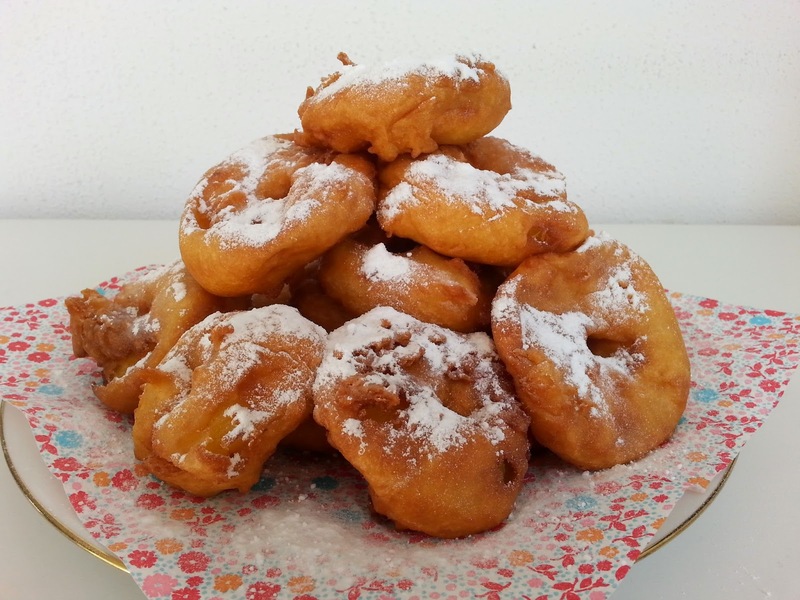 And best of it is to eat them with LOADS of icing sugar LOL! And then the year 2014 is almost done with already. Cannot believe it went by so quickly, lots of things happened in our life this year, and it wasn't always the bst but we hope next year will give us some more good things and it will be more "relaxed". For all that health is looking good upon us, that is a very important thing. 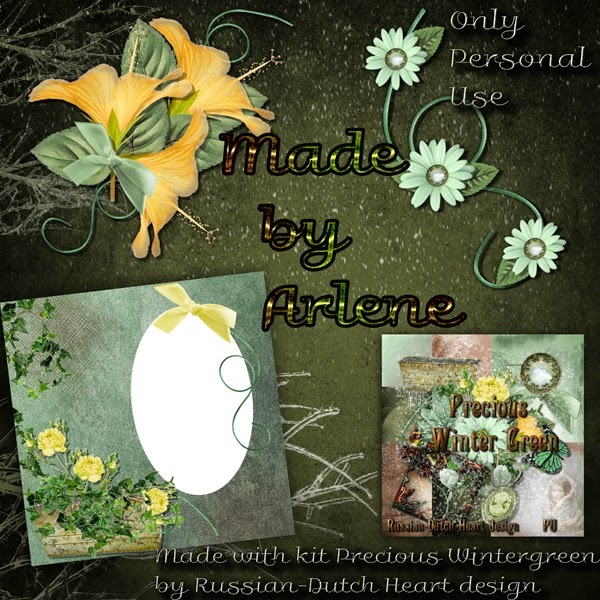 Not much more to tell, so better i give you the freebie for today, two clusters and a quickpage made by Arlene, so pretty, made with the Precious Winter Green kit. Oh my, those desserts look so delicious!! I agree a lot has happened this year, and hopefully next year is going to be a fabulous year!!! I would like to be able to get out more with my camera, and maybe take a few "mini" vacations with Pogo. So hopefully the new year will be a fun year. Today is sunny and not too cold but we have an Artic Freeze coming in and it will be here for quite a while. I'm just thinking "Spring". It's less than three months away. Woo Hoo! Kyra, you have a wonderful day, hugs, Edna B.
I too am thankful the rush to parties, and gatherings is almost done. I do New Year in front of the TV, watching from one time zone to another. Thank you to Arlene for the pretty clusters. I'm using the kit right now to make a page of the Gr-grandson in his new car. Thank you and Happy and Prosperous New Year to you and Jan. The pastries look really good! I hope you had a lovely Christmas. I used some more of your lovely sparkly things here: http://ladyoftheapocalypse.deviantart.com/art/We-Three-Kings-503477927 I hope you and Jan have a wonderful and blessed new year!